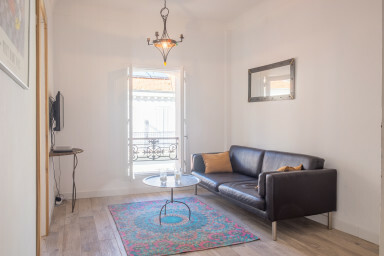 Cosy apartment In the heart of Cannes, in a quiet pedestrian street, perfect for congress. Located in a traditional French house, in the center of Cannes. Only 3 min to Palais des Festivals and less then 10 min to the beach, this is an ideal apartment both for holiday and congress. In the bedroom you have two single beds. Located on the third and top floor and with the windows facing the courtyard, you will not be disturbed by any noise from the street. The apartment was completely renovated in 2017 and partially furnished with furniture, designed and manufactured by the owner himself. The apartment is located in the central part of Cannes known as the “Cannes banane ‘because of its shape that looks like a banana with its extension along La Croisette and the beaches. Located on Rue Meynadier, one of Cannes’ oldest commercial streets and only 2-3 min to the Vieux Port (old port). You can not stay more central and close to the Palais des Festivals. We'll be pleased to get in contact, feel free to contact us for any questions you might have.